Spider-Man has worn plenty of different masks during his career as a superhero. Over the years, he’s worn a black mask to go with his symbiote suit. He’s worn an armored helmet to help him battle against heavy artillery. He’s even worn a paper bag over his head when he couldn’t find his own suit! Of course, we always preferred his classic red mask, with the white spider eyes, which is why we’re glad to see Peter Parker donning the classic mask in Marvel’s Spider-Man: Homecoming film. Now, your child can get the classic look of the film too! This licensed child Spider-Man hood will fit your kid perfectly! 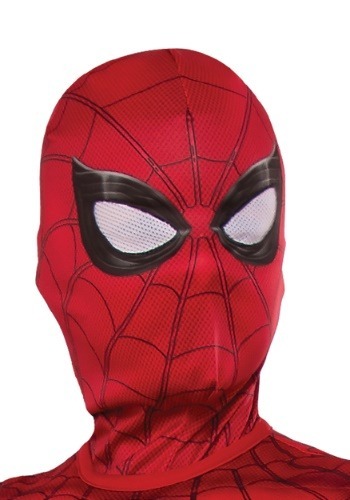 It has the printed webbing details that are normally seen on Spidey’s outfit, along with see-through white eyes. Your child will be ready to spot the bad guys while he keeps his secret identity under wraps. Just make sure to teach him that with great power comes great responsibility! It work so well for my costume best mask ever ! !